An interesting way to study or teach the scriptures is to take a site or geographic feature and collect all the verses that refer to that location. Such a diachronic study reveals connections that aren’t otherwise readily apparent. An excellent example of this is the Euphrates River which is mentioned in both Genesis and Revelation, as well as other places in the Bible. This week's photo comes from Volume 9 of the revised and expanded edition of the Pictorial Library of Bible Lands, which focuses on Eastern and Central Turkey. The photo was taken by A.D. Riddle and is entitled "Euphrates River North of Carchemish View East" (photo ID #: adr1005191623). The Euphrates River figures prominently in Scripture, being mentioned dozens of times from its first reference in Genesis 2:14 to the last reference in Revelation 16:12. The source of the river is in the mountains of Armenia northwest of Lake Van at an elevation of more than 10,790 feet (3,290 m). The river then flows through the modern countries of Turkey, Syria, and Iraq before merging with the Tigris River and emptying into the Persian Gulf, traveling a total distance of about 2,000 miles (3,200 km). 1. 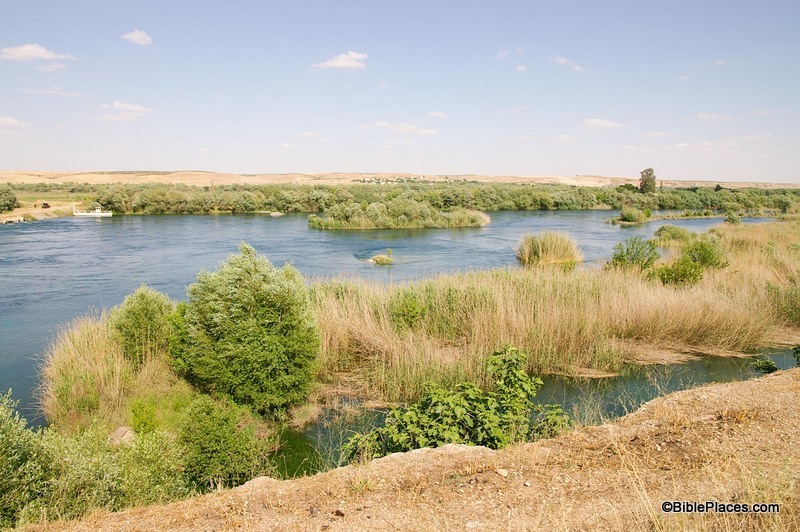 The Euphrates River is one of four that flowed from the Garden of Eden (Gen 2:14). 2. The Lord promised to give Abraham the land between the Euphrates River and the river of Egypt (Gen 15:18; cf. Deut 1:7; 11:24; Josh 1:4; 24:2). 3. Jacob fled from Laban across the Euphrates River (Gen 31:21). 4. King David built a monument along the Euphrates River (2 Sam 8:3; 1 Chr 18:3). 5. Solomon ruled over all the kingdoms as far north as the Euphrates River (1 Kgs 4:21, 24; 2 Chr 9:26; cf. Ps 72:8). 6. The Lord promised to bring an invader from the other side of the Euphrates River (Isa 7:20; 8:7), but also to bring them back from exile from beyond the Euphrates River (Isa 11:15) and restore their dominion over the land “from the River to the ends of the earth” (Zech 9:10, LEB). 7. Jeremiah accused the Israelites of faithlessness to the Lord by asking why they went to “drink the waters of the Euphrates” (Jer 2:18, LEB). 8. The sixth angel will pour out his bowl on the Euphrates, causing it to dry up and allow passage of the enemy kings to attack Israel (Rev 16:12). If a student can answer that question, then they know their stuff. Most likely, you could drop them anywhere in the Bible and they will have their bearings. This and other photos of the Euphrates River are included in Volume 9 of the Pictorial Library of Bible Lands and can be purchased here. Interesting post. Thanks for writing. I have a question regarding that first reference. Since Genesis 2 relates to prediluvian earth, how can we know that the Euphrates mentioned there is the same as the one after the flood, since it is presumed that the earth changed a lot during the flood. Eric - I can safely say this: none of the photos show the prediluvian Euphrates! As for how much it changed before and after, I don't know. There seems to be some connection given the pairing with the Tigris River. That article states that the current Tigris & Euphrates Rivers are not the ones mentioned in Genesis 2 due to the changes that the Flood caused. They propose that Noah and his descendants named the current rivers after the prediluvian rivers, similar to how settlers of the New World named things after places they knew back in Europe. If Noah had named the river after the flood and John got the vision in revelation also after the flood it would stand to reason that he would be referring to the current river and not the one before the flood.